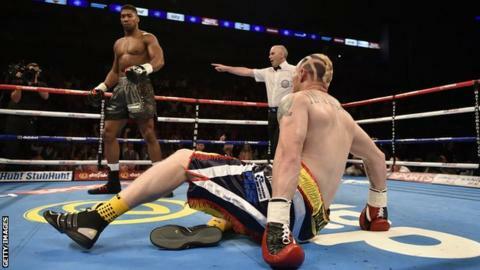 A Scottish heavyweight boxer who lost a Commonwealth title fight to Anthony Joshua has described having to retire on medical grounds as "devastating". Gary Cornish, 31, who was beaten by the IBF, WBA and WBO champion three-and-a-half years ago, had his licence revoked after a routine brain scan last year. And after two unsuccessful appeals against the British Boxing Board of Control ruling, he has called time. "It is an expert's advice not to box, so I have to deal with it," he said. ''You put your life in danger every time you step in through the ropes so, but they are covering themselves and I respect that." Cornish, 31, first discovered his licence had been revoked early last year on the final day of a sparring camp with former WBA champion Alexander Povetkin in Russia. "Training was going amazingly. I was sparring with the boy who was ranked second in the world and it was going brilliantly," he said. "I was looking in really good nick for the next fight and that makes it especially frustrating. "This is what I've done for over 10 years. Nobody, unless they've done it, knows what that buzz is like, being in the ring, and to know I won't be back is devastating." Cornish ends his career with just two defeats to his name - Sam Sexton beating him in a British title fight in 2017 after that loss to Joshua two years earlier. He says he can "look back and be happy" with his eight-year career but does harbour a degree of regret that he did not take up the sport earlier. "I wish I had come into it when I was younger," said the former Brora Rangers footballer, who won 25 of his 27 fights. "The discipline it gave me was brilliant. Everyone says I am so calm with everything and that is boxing. If kids can get into it, it will give them discipline for things like school, everything. "I started off boxing just to get fit for football, and it just took off, I started an amateur career, won the Scottish Championship, then went pro, so I can look back and be happy."